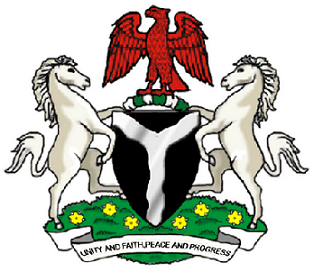 The Nigeria coat-of-arms is the country’s symbol of national unity, state power, and authority. It was created in line with the National Flag and Coat-of-Arms Ordinance number 48 of 1960. The Nigeria coat-of-arms was adopted officially in 1975. Before this time, each of the country’s constituent political units had its own coat-of-arms. The black shield represents the fertile soil of Nigeria. The white wavy bands that form a letter “Y” represent the country’s main inland waterways, the rivers Niger and Benue (which both meet to form a confluence at Lokoja). The two horses at either side of the shield represent the dignity and pride of Nigeria. The yellow flowers at the base are Coctus spectabilis, a type of flower that is found in all parts of the country. The eagle represents the pride of Nigeria while the green and white wreath on which the eagle stands represents the rich agricultural potential of Nigeria. The national motto, “Unity and Faith, Peace and Progress”, is written on the band around the base. This motto was adopted in 1978. Before that time, the country’s motto was “Peace, Unity, Freedom”.